1.Drill 2 parallel holes(Ø6mm each) in the wall. The distance between the holes should be 700mm. 3.Leave a 8 mm gap between the wall abd the screw's head.Lift the unit with the attached wall brackets over the heads of the screws and slot into place. What do traditional devices like TVs, PCs and DVDs have in common with in-demand Bluetooth gadgetry? 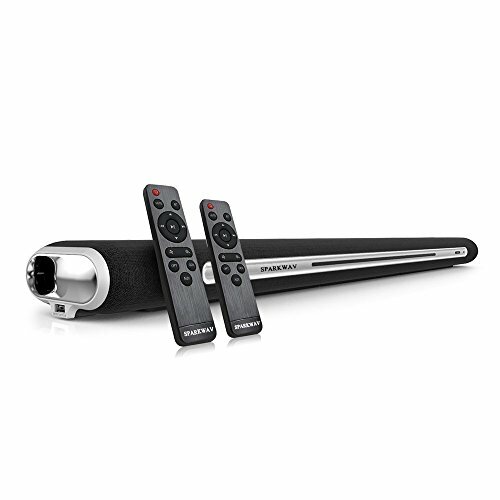 Both can connect to the sound bar for unparalleled convenience and usability. The sound bar allows wired connections included LINE IN, Optical, Coaxial, and RCA IN so practically every device can connect; while your favorite smartphones, tablets, and other Bluetooth devices have the option to connect wirelessly. A sound bar adds a modern and exciting touch to any home, elevating your standard living room into a personal theatre system so you'll never watch a film anywhere else. Sitting low and stretching long, the sound bar uses tough ABS plastic and is covered by a soft touch cloth ensuring you'll have great sound for years to come. Soundbar is the electronic charging products directly, please let the children and water away from soundbar and remote, close to avoid short circuit, the remote control is not a toy, please pay attention to the use of children, so as to avoid damage. 1.Never Worry About Losing Remote Control :double remote controls are Supporting multiplayer.Sometimes we can't find the remote control. if can't find,that's OK. We still have one as a spare.Use infrared transmit signals, with the soundbar receiving the middle of the signal, the remote control easy to control the soundbar.soundbar also can be a stage subwoofer. 2.Advantage Home theater sound :loud and clear,stereo mainly,a little bass,independently,can't be working with subwoofer,power come to 60W,so the volume louder than others. Soundbar : channel 2.1,digital amplifier with dsp inside,.have 2x10W loudspeakers, 4x10W bass speakers, can perform better in most of the audio range,when using the USB model,without pairing bluetooth,by the U disk,MP3,cell phone,iPad,laptop,PC,to play the music directly;via remote and touch keys, adjust the volume. 3.Dissipate Heat :The length of soundbar is 35 inch,the design of two deep air reflex with wind control oval, this design can let us in use, with the sound from both ends can accelerate the air diffusion, internal diffusion from the soundbar, so the heat also accelerated with air diffusion from both ends. The appearance of the soundbar is made of gauze and stainless steel mesh, Compared to competitors, our home entertainment system better deal with heat dissipation and sound. 4. 6 Soundbar Multi-player Modes: this TV electronic equipment is a television video products,have 6 soundbar modes.when LED Status Indicator change, the different color meet different modes: Red=Standby mode, Blue=Bluetooth 4.1 mode,Cyan=Optical audio input mode, Pink=Coaxial digital audio input mode, Green=AUX/RCA input mode by cable connection, Yellow=USB mode, also.connection to computer,notebookand laptop.we can touch the front of the power button to change , also by the remote control. 5.Mountable Way: take three ways to mount, the first: we can be mountable on wall ,the back design of soundbar have 2 grooves,According to the instructions, two nails fixed to the wall, we can easily put soundbar hanging on the wall. the second: place the soundbar on the desk, With four brief legs, we can easily and smoothly place it on the table in car,living room and sleeping room.the end: We can put it in the mezzanine of the cabinet, because the height is no more than 2.7 inches. If you have any questions about this product by SPARKWAV, contact us by completing and submitting the form below. If you are looking for a specif part number, please include it with your message.